ISOBO Aktiv is designed by Sjo Fasting AS and Arkitektkontoret IHT for Jadarhus AS. 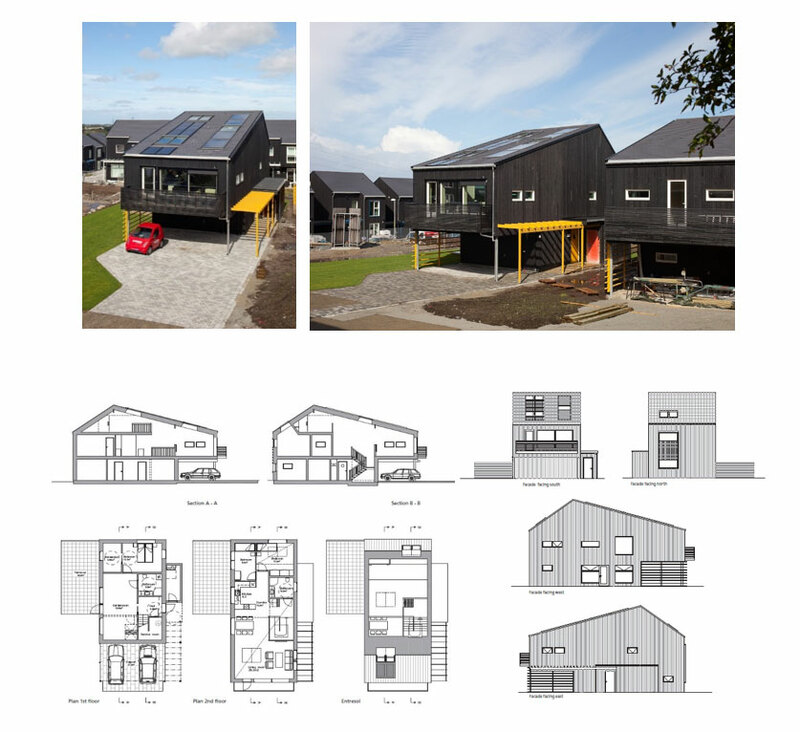 It has has been awarded with the Active House label, and it is the first labeled project in Norway. ISOBO Aktiv has been selected by an international active house joury, who awarded the house because of its energy efficiency performance , meeting very strict energy requirements as well as due to its very designed indoor conditions, with open spaces, natural ventilation and good daylight conditions. Oluf Langhelle, the own who is living in the house has been interviewed during the award process and this is what he revealed about his experience: I have been living in this house and I can tell that, because of the Active House principles applied to the design of our house, we feel connected to the outdoor environment and this gives us a very special feeling of being in a good and healthy house. 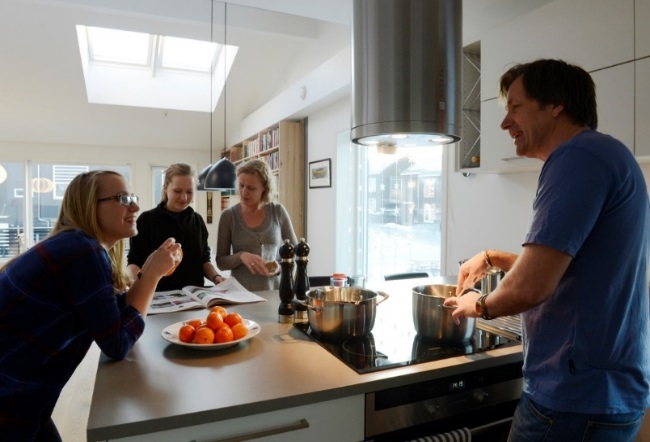 Oluf continue with a focus on the interior design: ‘The volume of the building with the large celling height create well daylighted rooms and it makes me feel that I am living in a much bigger house. The extra energy loss from the windows is small compared to the value I get from the sunlight into the room and the better comfort” he added. The upper floor are well day lighted with view and contacts to the main floor. The room at ground level has large window areas, direct access to the outside and direct access to the well daylighted staircase. The rooms in the ground floor are connected making the ground floor an adult space. And asking the last questions on his personal experience: ‘I have learned, by moving into this house, that good indoor climate is very valuable for your health and the importance of being in contact with the outside. I have always underestimated the value of good indoor comfort, but now I think my house is better from inside then from outside’ Oluf concludes. ISOBO aktivhouse is built in Sandved Vest close to Stavanger in Norway. Sandved vest is a development area finished in the summer 2011. It has been divided into 3 phases and consists of 12 houses, 18 linked houses, 36 terrace houses and 16 apartments. 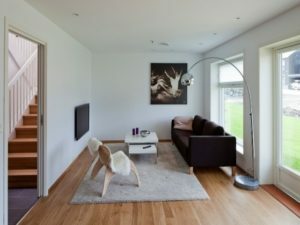 Twelve Jadarhus Isobo low-energy houses has been built up to best level of national low energy requirements. These are 3 single family houses and 9 row houses. One of the single family houses was further developed up to the Active House principles. The purpose of the ISOBO Aktiv house is to test different technical solutions in one single building. Another purpose is to look at which measures must be taken to get the best possible, optimal indoor climate, especially, with a view to avoiding good internal comfort without overheating during summer. 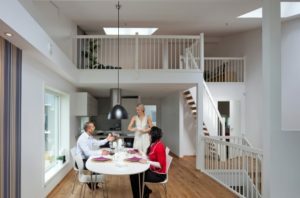 ISOBO Aktivhus evaluates several technical solutions in one design and identifies steps to design optimal indoor air quality. The building is based on passive measures and a compact building with extra insulation. 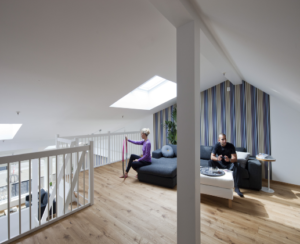 The issue of avoiding overheating resulted in a ventilated cooling design with several more skylights than normal, something that has other positive effects such as better daylight conditions with better spread of the daylight in the compact building. 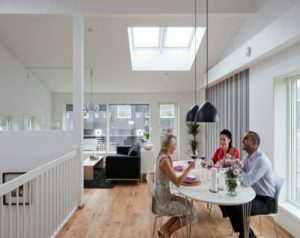 By getting more natural daylight into the house, the use of electric light is reduced which gives an energy gain and increased quality of life – natural light is better for people than artificial light. The house has been constructed as a timber house with traditional rafter construction. By using our usual construction partners, all construction units will be delivered as precut, industrially produced and delivered dry to the building site ready for assembly. This will also minimize waste during production. 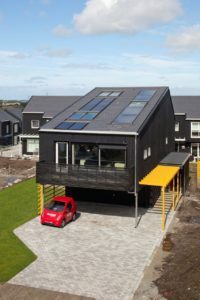 Active House, is a vision of buildings that create healthier and more comfortable lives for their occupants without negative impact on the climate. 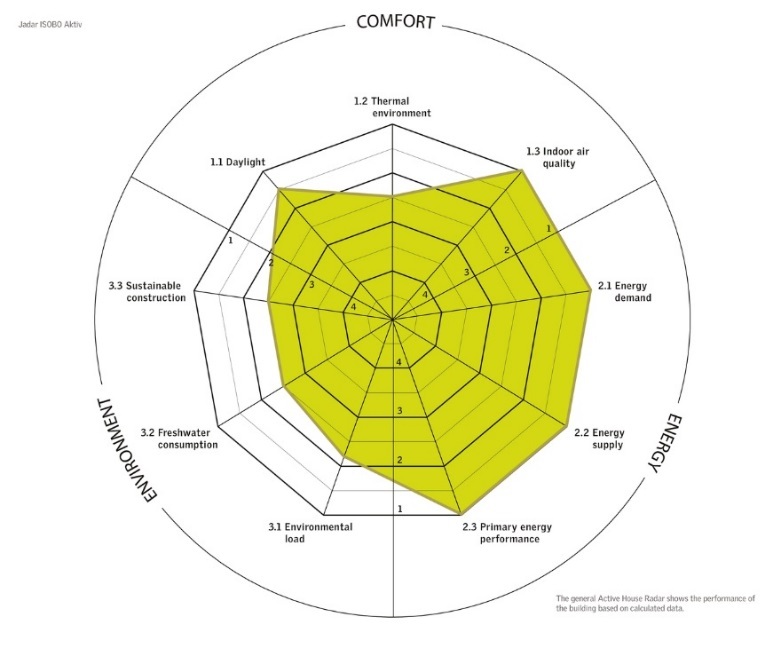 The vision includes a holistic view on buildings where buildings are evaluated within 3 parameters: Comfort, Energy and Environment. The daylight conditions have been calculated with a daylight visualizer in order to optimize daylight in among others the staircases. The air quality and the thermal comfort levels has been optimized and are controlled automatically by io-home-control system. Final energy demand is 44 kWh/m2, which is reached by energy efficient walls with U value of 0.09-0.11 W/m2K and windows with U-value of 0.74-1.0 W/m2K, minimized thermal bridges and airtight constructions. The energy is delivered by renewable energy on site with solar collector and heat pump (ground heat) cover 95% of space heating and 90% of hot water for the buildings yearly energy requirement. 8 solar cell panels produce 1200 kWh per year. The construction is made of wood with loadbearing constructions based on I beams of wood allowing for efficient insulation and reuse of materials. Waste during construction has been minimized due to the industrial production of wall and roofs.